The Air Oasis G3 3000 Air Sanifier is the perfect unit for kennel areas or other rooms in veterinary clinics, boarding and grooming facilities up to 1500 square feet with up to 6 dogs. Can be used to sanitize exam and kennel areas. Remember, the Air Oasis G3 3000 works for rooms up to 1500 square feet with up to 6 dogs. If you need a more powerful unit, check out the light commercial Air Oasis G3 3000 Xtreme or the Air Oasis 5000PRO G3. If you have a smaller space to treat, such as a room up to 700 square feet with 1 or 2 dogs, the Air Oasis G3 1000 is a good choice. For very small areas like a car, van, hotel room or bathroom less than 250 square feet, see the Air Oasis G3 Mobile and Small Room unit. 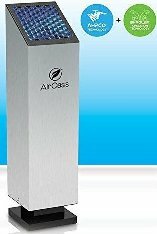 Or, if you are interested in a whole building model that works with your forced air heating and air conditioning system, see the Air Oasis G3 Whole House Air Purifiers.